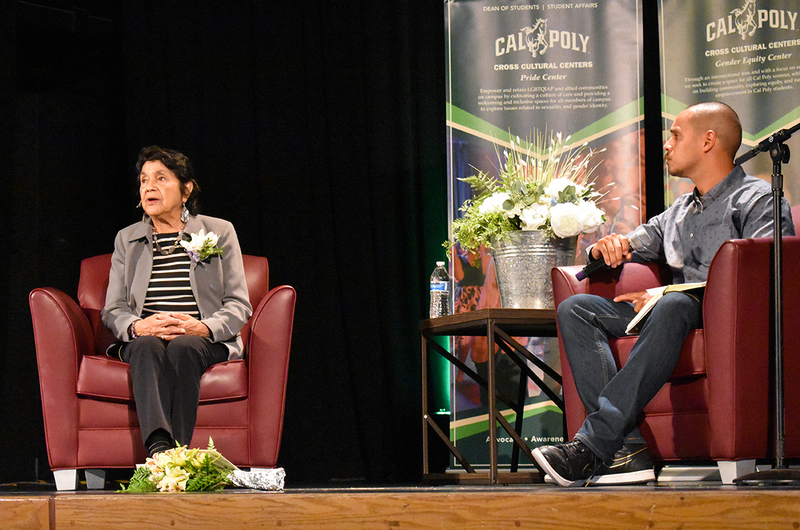 Civil rights activist Dolores Huerta spoke to a packed Chumash Auditorium Thursday, May 10 regarding campus climate and social activism. The Cross Cultural Centers organized the event and Huerta’s appearance was just one of many events taking place as part of the Office of University Diversity and Inclusion’s Inclusion Excellence Month. Clark recently attended a talk called “White Skeptics” which discussed how to talk to white individuals who do not think racism or discrimination still exist. “I think a lot of people, by going to talks like that might see how they can actually use their power and their minds to make a difference and to change campus if they are upset about what’s going on,” she said. Huerta has been a part of the fight for equality for more than 50 years. In 1962, she co-founded the United Farm Workers of America with Cesar Chavez, which later became the United Farm Workers union. The 88-year-old, mother-of-11 labor leader shared her journey as a community organizer, giving advice to Cal Poly and San Luis Obispo residents on fighting for equality. Huerta said one of the biggest issues contributing to inequality is misrepresentation in the U.S. Census. Many undocumented immigrant families do not fill out census forms because of fear of persecution, according to Huerta. She argued that this leads to a lack of representation and structural support for these communities. To have a voice, she said, we have to utilize our right to vote and to campaign. Huerta compared issues present today to those of the Civil Rights Movement that occurred in the 1960s, calling this an “economic revolution” as opposed to a cultural revolution. In a recent study from a high school district that expelled and suspended more than 2,000 students, Huerta said Black students and Latinx students are expelled 600 and 500 times more than white students, respectively. The only solution is education. Huerta’s last message to Cal Poly was to remember that we are all one people, one human race.